I hope everyone had a wonderful Thanksgiving holiday! We enjoyed getting the opportunity to serve in the city this year & then spend some quality family time at home together. It dropped into the low 30’s over the weekend so I quickly went to work pulling all my coats out of storage and getting them organized for the winter season. I always tend to gravitate more towards neutrals this time of year and this bundled up look was ideal for our frigid temperatures. I have been on the hunt for the perfect cable-knit turtleneck since last year and this one is exactly what I’ve been searching for – not itchy or overly bulky & just the right length for layering or tucking. I recommend sizing down as this does run big (I’m wearing an XS here). Right now you can get it for 30% off + free shipping with code CYBER17. With it being Cyber Monday, I thought I’d share some of my favorites from the best sales happening today. As always, you can view a more comprehensive list on the Sales Alerts page, which is updated every weekday morning. Ann Taylor – 50% off everything + free shipping on all orders using code BESTMONDAY – I’m finally pulling the trigger on this statement coat, this camel blazer & this emerald skirt. Gap – 50% off everything with no exclusions & free shipping on all orders with code CYBER + an extra 10% off online only using code TREAT & earn $25 in Gap Cash for every $50 you spend! I use sales like this to stock up on basics like denim & bras but it’s also a great time to find more special pieces for less – this cable knit sweater is nearly identical to the one I’m wearing here; also loving these metallic block heel pumps, this fringe skirt & this velvet blazer. J. Crew – 40% off everything + an extra 10% off your online order until noon EST today & free shipping on all orders with code SHOPFAST. 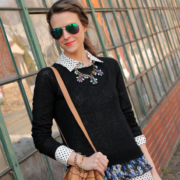 I’m eyeing out this gorgeous lace blouse, these sparkly earrings & this classic sweater. 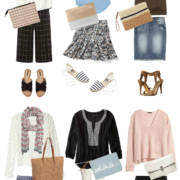 Talbots – 50% off one regular priced item & 40% off everything else + free shipping on all orders (no code needed; discount taken at checkout. If you haven’t shopped here in a while, it’s worth a look – check out this fringed sweater, these leopard flats & this suede bag. Neutral, elegant and perfectly styled Fall outfit! I like your boots and bag very much. Thanksgiving festivies, new traditions are exciting! love how to styled this mix up look was ideal. So many sales going on it is crazy! Love this roundup of options! Great idea to wear neutrals! Might have to steal the idea! I love this jumper so so much, the whole outfit is amazing – looks so chic and put together! I love your outfit! Your coat is so beautiful!! That does look like the perfect turtleneck, and I love your faux suede pants.